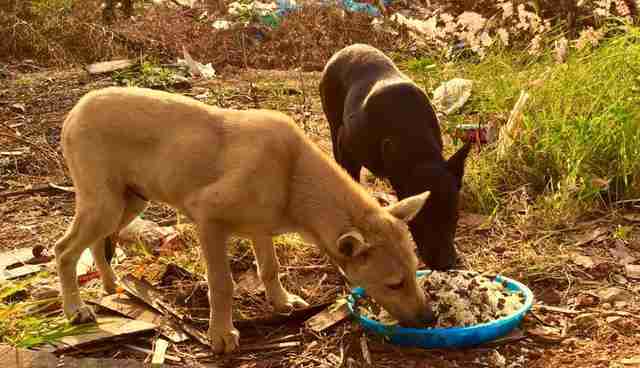 While I was on the phone with Michael Baines, he didn't miss a beat as he fed the roughly 80 stray dogs along his daily route in Chonburi, Thailand. He took my call not long after he woke up on what was his Saturday morning, prepared their food and drove to the first of three locations to care for the dogs he has been feeding for five years. He didn't drop his phone once on his important mission, while I got to ride along with him by phone from 8,387 miles away. The dogs he feeds and cares for have come to trust him and expect him daily. He is certainly a huge part of why and how they survive in a country that does not always take too kindly to dogs. "Many people see an animal here and will hit the dog with sticks, stones and machetes, and use knives or kill them with guns," Baines said. Some people have been known to throw boiling water on dogs as well as poison them, he said, which is why Baines carries a $10 bottle of antidote in his car. Born in Scotland, Baines's family moved to Sweden when he was 2 years old. After spending some holidays in Thailand and in need of a change, he found a job and moved to the country in 2002. Baines, 48, is now the chef and general manager of Carrot, a restaurant in Chonburi. 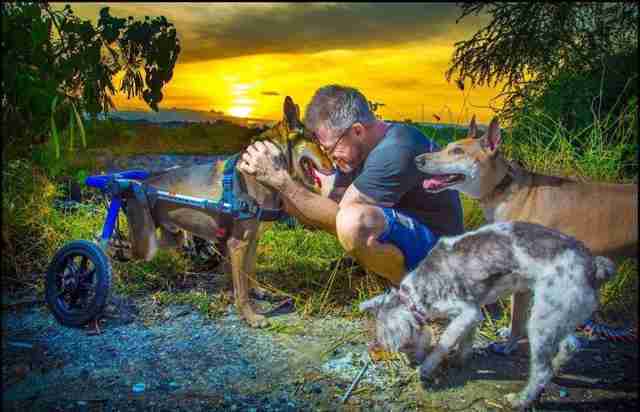 Baines feeds the stray dogs once a day, making a total of 17 stops along three different routes. 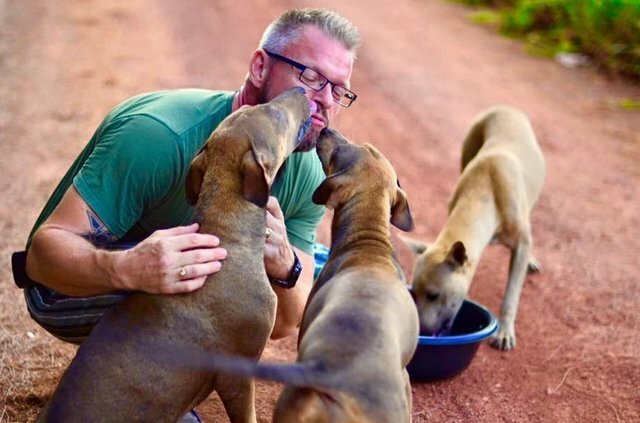 From his home to work, he makes eight stops to feed 30 dogs. 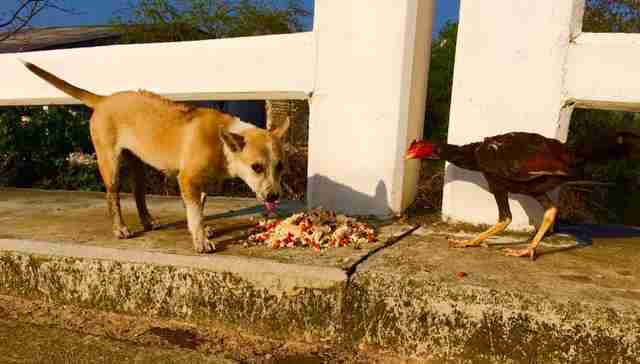 After breakfast at his restaurant, he gathers the food for the second run, making eight or nine stops to feed 30 to 35 dogs. He then feeds another six dogs outside his restaurant, and four to five dogs on his way home after work. The dogs eat dry food and boiled rice together with vegetable oil and bouillon, and a boiled chicken, pork and fish mixture for taste. Once a month, Baines adds in a powder that prevents various worms, ticks and fleas. Most of the costs are self-funded or garnered through donations. When Baines first started his mission, he had a restaurant in another part of Thailand. A dog showed up in the back of the building covered in wounds and with various infections - and she had recently given birth. "I started to feed her and that was the start," Baines said. "I looked into her eyes. In [them] she said, 'Help me. I'm hungry.' She touched me. I started to see how they suffer and how friendly they are. I started to interact with them more, and started to feed them. It escalated and now it's [been] five years." When he pulls up to one of his regular stops, the dogs usually know him by the sound of his car. "A few of them are really friendly," he said. "I can hug them and play with them. Some are really scared, even after two years. One of the best feelings is when you have an old dog who has been abused all her life and you can actually touch them and hug them. It can take two years, but when it happens, it is amazing." Most of the dogs on Baines's daily stops are regulars. 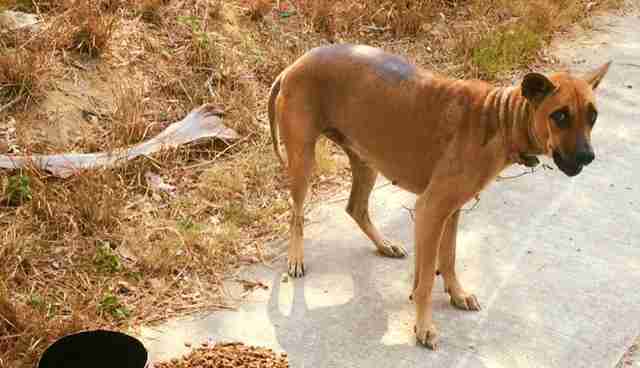 This past March, someone poisoned about 15 of the street dogs along Baines's route, he said. "They put coolant on the street, and the dogs drank it and they died," Baines said. "I could only find three bodies." Sometimes there are new dogs because a common solution to a pregnant dog is to throw the puppies into the woods, according to Baines. Over the years, Baines has been able to get more dogs spayed and neutered. He also provides antibiotics to dogs who are sick, but is unable to permanently house the dogs himself due to lack of space. "I don't have any place to keep them," Baines said. However, if there is an exceptionally vulnerable dog, he will keep the dog temporarily at his restaurant and try to find a home. Astonishingly, he has had a 100 percent success rate on adoptions. 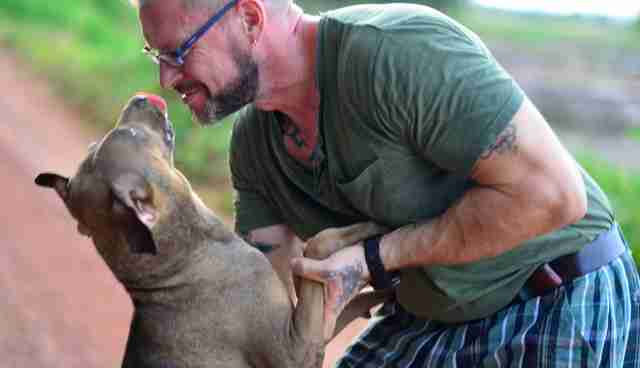 Along with the street dogs he feeds, Baines has nine dogs of his own at home, all from the streets of Thailand. "Nine is not crazy, but 10 would be crazy," he said jokingly. "Nine is a good number." His dog Coke is in a wheelchair. Coke's previous owner let him run around in the streets, which is common in Thailand. Coke was hit by a car and suffered a broken spine. Baines offered a wheelchair to the owner, who then asked Baines to take the dog. 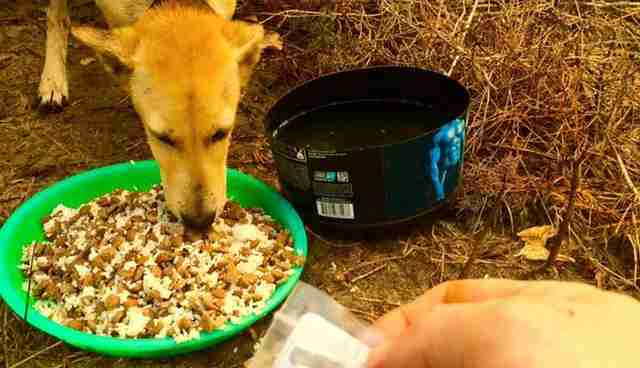 Another dog Baines fed for a year and a half had a limp because his paw was crushed in an accident. His leg subsequently had to be amputated. "I couldn't take him back to the street, so I adopted him," Baines said. There are countless strays in Thailand, the actual number of which is unknown, though there are estimated to be as many as 300,000 in Bangkok, the capital, alone. Baines said there is one small city shelter, but dogs typically languish there. He is on good footing with them and hopes to see some changes. But change takes time. "All the people here say there are too many dogs and want to shoot them," Baines said. "People in Thailand say it's a dog problem," he added. "I say it's a people problem. If they start to educate, the people problem will slowly go away, and the dogs will live happily ever after." 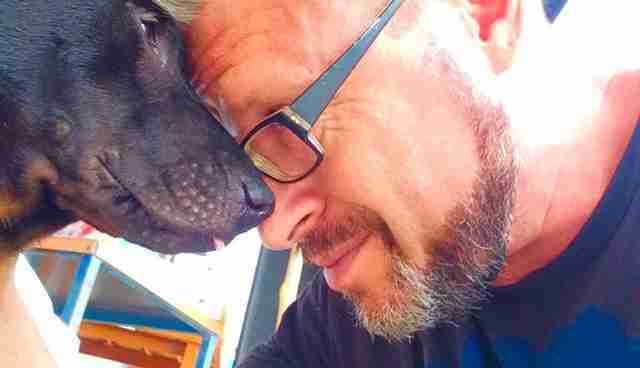 Baines suffered a stroke a couple years ago and fought hard to come back healthy and strong for all his dogs. His dream is to be able to help the dogs full-time and possibly find some good volunteers. "Adopt. Don't shop," he said. "You don't need to buy a breed. Find a mix. I think it's the best." "The dogs keep me going - my own dogs and the street dogs," Baines said. "If I hadn't had my dogs and the street dogs, I'd probably be quite miserable. They make me happy." You can make a donation and find out more about Michael and how he helps feed and care for the stray dogs here.